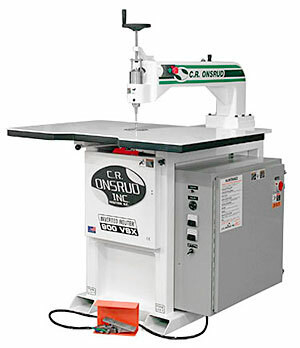 The Onsrud Inverted Router™ has become the standard replacement for the conventional overhead router. An Inverted Router™ is simply more versatile, more accurate, safer and easier to operate. The added flexibility and improved performance alone make the Inverted Router™ the obvious choice for anyone who has ever used one. Simplicity of set-up and operation reduces the amount of skill and training required of new operators and pattern makers. More efficient dust collection, quietness and ease of operation make work much less tiring when compared with overhead routers. Samples or low volume items can be done more easily and economically. Templates are made right on the machine. 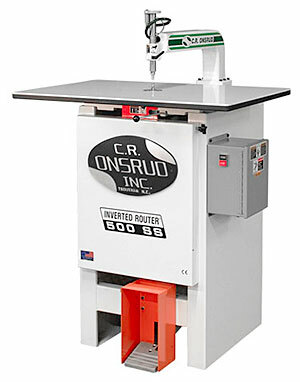 Whether you intend to use your Onsrud Inverted Router™ for all of your routing, or only for secondary operations after processing on one of our Heavy Duty CNC Routers, the Onsrud Inverted Router™ is simply an indispensable tool. 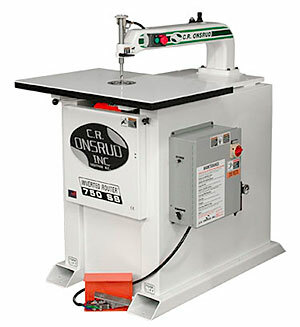 The Onsrud model 500 SS is capable of plunge routing and profiling both inside cuts in hardwoods, softwoods, man-made woods, non-ferrous metals, aluminum, and a variety of plastics and composites. The 500 SS is generally best utilized in intermittent duty/light production duty. The Onsrud model 750 SS is a production duty router that can be used, when properly maintained, for up to 3 shifts per day. 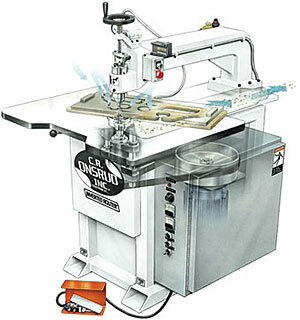 It is capable of plunge routing and profiling both inside and outside cuts in hardwoods, softwoods, man-made woods, non-ferrous metals, aluminum, and a variety of plastics and composites. The 750 SS is generally best utilized in medium to light.heavy duty routing applications. Pneumatic Spindle Plunge of 0-3"
The models 900 VS and 900 VSX are Onsrud's finest Inverted Routers™, ruggedly built for continuous production duty under severe conditions for up to three shifts per day. Both are capable of plunge routing and profiling both inside and outside cuts in hardwoods, softwoods, man-made woods, non-ferrous metals, aluminum, and a variety of plastics and composites. Only the very best components are incorporated into these tough, dependable machines, assuring you many years of precision performance. Quick-change pulleys (900 VS) or electronic variable-speed drive (900 VSX) for the ultimate in precision and convenience. Machine at exactly the right rpm for any application!